Project Description: An egg-cellent project to make with the kids! Punch 4 holes on all 4 sides of the Craft Plastic. Be sure holes are evenly spaced on all pieces. Tie the sides of the basket together with 3” strips of ribbon. “Sew” the 4 sides to the bottom with embroidery thread. Repeat the process with a second strand to ensure secure attachment. Frame the top edge of the basket using the same “sewing” technique. Cut a piece of Craft Plastic to make a 1.5” wide handle and hole punch each end. Attach handle with brads. 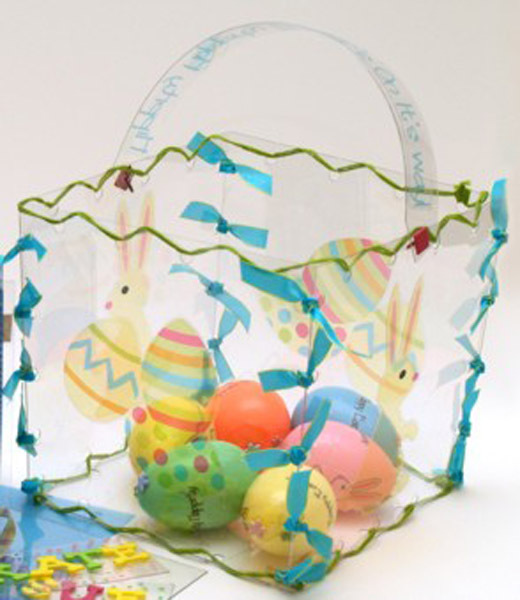 Embellish your basket by printing clip art and phrases on to Computer Grafix film and stick to the sides and handle. Fill with grass and eggs for a fun Easter decoration or gift!